I went to the Vitality Show on Saturday. I'm not going to talk much about it because it tends to be a popular blogging topic. I think this was the fourth year I have visited but I did feel it was not as good as previous years. You all know I like Niki's Organic Balms. She was at the show so I popped by for a chat. Niki pointed me in the direction of Mimi's Miracle and I decided I'd like to share this discovery with you. As you know I love to support small natural brands and Mimi's ticks all the boxes for me. The story behind the products is a familiar one. Mimi and her family suffer from eczema, allergies and psoriasis. After a recommended brand product flared up Mimi's skin her mother created the products as she saw a need for natural ointments for her family. Products are 100% natural and free from SLS, SLES, alcohol, parabens, lanolin, perfume and petrochemicals. They also do not contain nut derived ingredients as the family have first hand experience of this allergy. 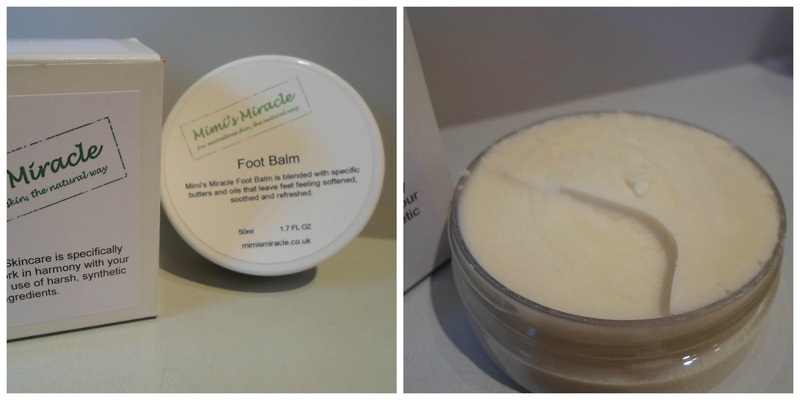 The range includes body butters, scrubs for face, body and feet, soaps and facial oils. Prices are fantastic value for money everything is under £8. I ended up buying the foot balm and I can not wait to start pampering my feet as the cold weather has left them in a terrible condition. Most of the creams are shea butter based and you all know I love my shea butter! If you would like to learn more about Mimi's Miracle or buy products, please visit Mimi's website and Facebook page.